Berlin [Germany]/ London [United Kingdom], June 29 (ANI): The Free Balochistan Movement (FBM) has concluded its "successful" international campaigns in different cities of Europe, America and Canada on Thursday. The FBM announced in early Junethat it will organise different events to commemorate the 'InternationalDay in Support of Torture Victims' on June 26. The FBM started the first phase of its sit-in protest in London outside the Chinese Embassy on June 24 which continued till June 26. The protesters distributed thousands of leaflets to passerby and explained China's evils and expansionist designs in Balochistan. The Chinese Embassy in Londontried to mislead the British police into believing that the current Baloch national flag is only used by an armed resistance organisation. The FBM activists, however explained it to the police that the flag is widely used in Balochistan and abroad as the national flag of Balochistan and it doesn't belong to a single armed group or political party. "On the last day of their protests (June 26), the FBM activists organised a huge demonstration outside the Chinese Embassy in London. The protesters including women and children carried placards, banners and flags of Balochistan. They also chanted slogans against Pakistan and China. Terming China 'East India Company in Balochistan' the protesters have demanded from China to 'Go back and leave Balochistan'," read a statement. Meanwhile, the FBM activists also held a two-hour protest at Dam Square in Netherland's Amsterdam city, a four-hour campaign in Vancouver Canada and a 24 hours protest in front of Chinese Consulate in New York. In Amsterdam, the FBM activists staged a visual drama to show Pakistani state barbarities in Balochistan and distributed leaflets which detailed Pakistan's atrocities in Balochistan. The leaflet also explained China's expansionist designs and its assistance to Pakistan against Baloch nationalstruggle. Furthermore, in Canada's Vancouvercity FBM activists organised an awareness campaign at SimonFraser University (SFU). The activists informed students and visitors about Pakistani forces offensives in Balochistan and China's support to Pakistan to expel Baloch from their native homes. According to the statement in New York, the FBM activists carried placards, banners and flags of Balochistan. They also chanted slogans against China's involvement and support to Pakistan in committing human rights violations in Balochistan. The Baloch activists also used a projector to display videos and pictures of Pakistan's state brutalities in Balochistan including of houses of Baloch people, destroyed by Pakistani forces indiscriminate bombardment. The FBM activists said that Pakistan was an occupying state in Balochistan and China was giving support and succour to Pakistan against Baloch nation. "We want to tell the world that China is equally responsible for crimes against the Baloch nation that Pakistan has been committing since the occupation of Balochistan in 1948. The Baloch nation will never abandon their land and allow any foreign design to succeed in Balochistan." The second phase of Free Balochistan Movement InternationalCampaign was held in Germany's Berlin city from 26 - 28 June outside the Chinese Embassy. The Baloch activists from different cities of Germany have visited the FBM sit-in protest and expressed their anger against China-Pakistan nexus in Balochistan. Local Germans also took a keen interest in FBM protest and showed their support for the just cause of Balochistan and expressed their sympathy for the Baloch nation. The Chinese Embassy staff tried to disrupt the sit-in protest by objecting to the use of megaphone but the FBM activists convinced the German police that they had the permission and were expressing their right to protest and freedom of expression. According to FBM Germany, activists have distributed more than 5,000 leaflets during their three-day sit-in protest and rally on 28 Junefrom Chinese Embassy to Alexanderplatz. The FBM rally participants carried placard and banners containing slogans against Pakistani state terrorism, China-Pakistan nexus, China's plan to build a naval base in Jiwani Balochistan, enforced-disappearances, the recent surge in the abduction of Baloch women and expulsion of Baloch from their native towns and cities to pave way for so-called China-Pakistan Economic Corridor (CPEC). "An aggressive group of Pakistanis tried to confront the FBM peaceful protest rally but the timely action of German Police foiled their bid to create any unfortunate incident. The Baloch protester remained peaceful throughout their three-day sit-in and on their rally," according to the statement. Addressing the participants of rally and demonstration, FBM Germany activists Beebagr Baloch, Fateh Jan Baloch, Sameer Baloch, Chakar Baloch and Elahi Bakhsh Baloch have said that no foreign countries can fulfil their dream of investment on the Baloch land without the consent and approval of the Baloch nation. 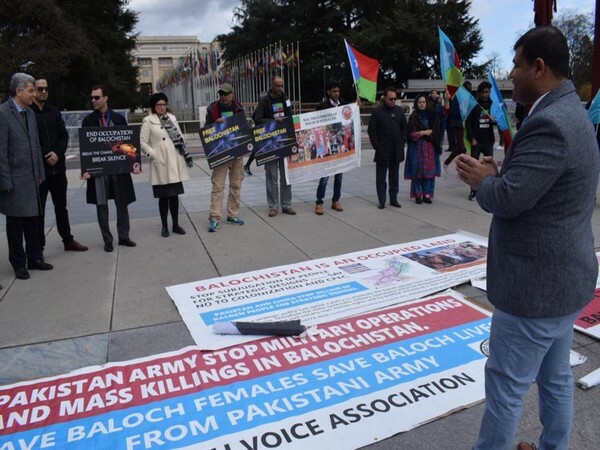 The speakers urged the International Human Rights Organisation, UN and rest of the civilised world to take notice of the Pakistani state atrocities in Balochistan and China's assistance to Pakistan in accelerating Baloch genocide. "The so-called CPEC (China-Pakistan Economic Corridor) has turned Balochistan into a graveyard for the indigenous people of Balochistan," the speaker charged.